The best water harvesting system is the one that will fit your particular needs, and grow with your garden. Beginning with a simple barrel placed under a downspout, you can add more collection units and storage tanks as your landscape needs dictate. Connect collection barrels to storage tanks with PVC pipe or hose, and the water can be moved to wherever you need it, whenever you need it. Its all about supply and demand. Includes everything you need to save rainwater safely and cleanly, the Flat-Back Rain Barrel will complement your garden in elegant fashion. Available in 3 colors and built from heavy duty materials that will last for years. Did you know, according to the U.S. Geographical Survey, the average American uses 80-100 gallons of water a day? That means a typical family of 4 could use up to 146,000 gallons of water every year. Expand your system to save even more water! 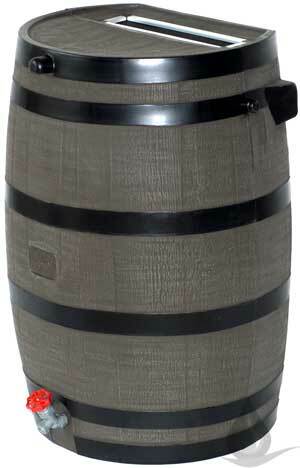 Woodgrain :: Save 50 gallons of clean, soft rainwater and adorn your garden with this elegant faux woodgrain flat-back plastic rain barrel. 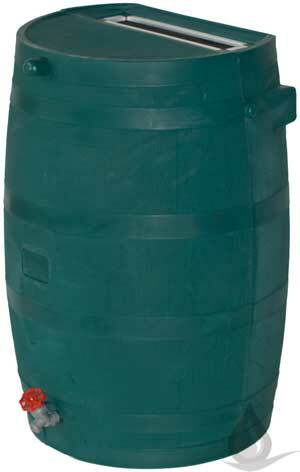 Green :: Save 50 gallons of clean, soft rainwater and adorn your garden with this elegant faux woodgrain flat-back plastic rain barrel. Tan :: Save 50 gallons of clean, soft rainwater and adorn your garden with this elegant faux woodgrain flat-back plastic rain barrel. 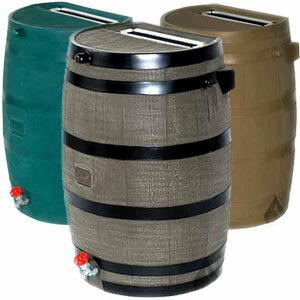 The Rain Harvest Flat-Back Rain Barrel comes with a two (2) year warranty.